The WisCon Art Show focuses on art exploring themes related to WisCon’s principles (SFF, feminism, social justice), work by artists of marginalized genders, and work by Midwestern artists. In past years, the Art Show has included painting, drawing, illustration, photography, comics, printmaking, jewelry and other wearable art, sculpture, and more. The Art Show operates like a gallery or store. It’s open for viewing only on Friday evening. Starting on Saturday morning, if you want a piece, you can buy it. We like to leave the art on display until Sunday evening so everyone can see it, but if you have to leave early you can take your purchased artwork with you when you go. Convention members have the opportunity to vote on awards in categories such as Best in Show, Best Wearable Art, and several others. Participate in the WisCon Art Show! Art is an important aspect of SFF, and an exciting Art Show is an important part of our convention! Work in all media is accepted. We are especially interested in displaying original pieces, but artists are also welcome to sell reproductions of their 2D work, multiple copies of comics, etc. You set fixed prices for your work (no bidding), and con-goers can purchase it during the Art Show’s open hours. You can also show work that is not for sale, if you wish. The Art Show has limited space for each artist, so those with a large number of items to sell may wish to consider the Dealers’ Room as an alternative. Applications must be submitted using our online form (you’ll need a wiscon.net user account). If you attend the convention, you will also need to purchase a WisCon membership. In mid-March, applicants will be notified of acceptance or waitlisting. This is a curated show and demand for space may exceed available slots, but most artists who meet the criteria and apply by the deadline are likely to get in. If you end up on the waitlist, we’ll contact you if a space opens up later. If you are accepted, we’ll follow up with further instructions, including a form you’ll need to complete listing your items and prices. An example of the panels and tables available to artists for displaying their work in the Art Show. While we do not charge for space, you must request the amount of space you want on the application form. Two types of space are available: vertical panels and tables (see photo above). 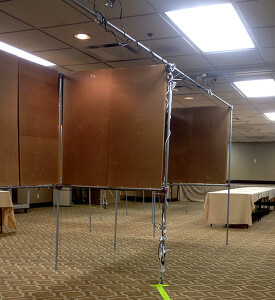 Artists new to the convention may request up to two 4’ x 4’ pegboard panels; for continuing artists, the maximum is three 4’ x 4’ panels. Table space is available in quarter-table increments, up to a full 1.5’ wide x 6’ long table. The maximum is one full table per artist. Attending artists set up their own work in their designated spaces on Friday afternoon. The Art Show provides hooks and clips for hanging work on our pegboard panels; framed pieces or canvases can be hung on hooks and unframed flat pieces with clips. Tables and tablecloths are provided by the hotel. We try to fit in all applicants who qualify, but may have to grant less space than requested. If your work requires special display conditions, please email us at artshow@wiscon.net to ensure that we can accommodate it. WisCon charges a 5% commission on artist sales (10% for mail-in art). This pays for the direct costs of the Art Show, including supplies and credit card transaction fees. After the con, participating artists receive a check or PayPal payment for their sales, minus the commission. Payments will be sent out by June 10. Our show is full of amazing, beautiful items, and sales are all processed by volunteers. Due to this, sometimes confusion or the less admirable parts of human nature can lead to lost items. We strive to prevent these losses, but if they do happen, the value of the item will be covered from the WisCon Art Show budget. We discourage mail-in art because we want you to participate in WisCon, and because we believe that having artists attend the convention increases sales significantly. If you do choose to mail in your art, our volunteers will hang or arrange it for you and then repack the unsold items for return shipping. Because of the additional work involved in handling mail-in art, we charge a 10% commission for it and limit the number of mail-in artists we can accept. As of 2017, accepted mail-in artists must also pay the return shipping cost for their unsold work. It takes over 100 at-con volunteer hours to keep the Art Show open and sell the art, so if you have work in the show (or not), please, please volunteer! If you volunteer during the con, you get to see the art, sit in a generally quiet space, and help people buy art. Or, if you’re local or arriving early, we always need more help setting up the room and panels on Thursday afternoon/evening. If you are interested in volunteering in the Art Show, please email us at artshow@wiscon.net. We love to see art-related programming items. If you are interested in presenting something, or have a suggestion for an art-related panel, please submit the idea through the regular programming form.